Figure 1. First Core Blowing Test. The bottom of the core collapsed due to a lack of strength. Brazilian steel giant Usiminas recently introduced the new foundry core making simulation software MAGMASOFT® as part of their strategy to establish robust designs and processes for their core production line. The first project on which this software was utilized was already in progress at that time. The main goal was to optimize the process conditions for the existing tooling layout. This core, called the thin waist core, represents some of the biggest challenges for Usiminas core production: its length (920 mm), substantial changes in the sand flow direction during blowing, the need to fill certain parts of the core through counter-flow and big variations in the cross section within the core. Figure 2. Curing Gas Concentration. The curing gas does not penetrate into the core to the same extent everywhere. The lack of core strength was related to a poor curing process. The first simulation (Figure 2) already showed that the problematic regions experienced only very low curing gas concentrations during gassing, which was the root cause for the failure. On the production line, various process conditions such as the curing and purging times and gassing pressure were changed. These attempts provided better results (Figure 3). However, a perfect core could still not be produced. 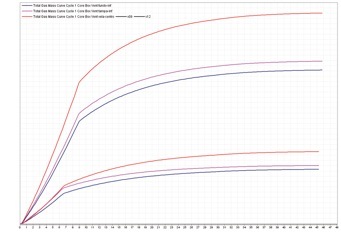 The further analysis with MAGMASOFT® focused on the evaluation of the local concentration of adsorbed curing gas, as it shows the regions where the catalyzing gassing agent cannot activate the chemical reaction. This result clearly demonstrated that only a very small quantity of catalyst was available for accelerating curing in the defect regions (Figure 3). Figure 3. Core Blown with new parameters in comparison with the local concentration of adsorbed curing gas. The problematic area corresponds exactly with low concentrations in the simulation. Instead of making costly modifications to the core box, Usiminas determined that a possible – and simple – solution was to close some vents in the top and center regions, in order to increase the gas concentration in the bottom. However, it was clear that these changes obviously would also influence the core blowing step. Figure 4. Total gas mass flow through the lower vents. The change in mass flow becomes clear. Removing some of the upper and middle vents resulted in a 36% increase in the gas escaping through the lower vents. Another characteristic of the defects was that they all occurred next to the parting line of the core box. Some of the defects showed a smooth surface, indicating that the sand had been removed by a strong air flow. The core blowing simulation results supported the Usiminas conclusion that an improper sealing of the tool was the root cause for these defects. Air could escape with high speed through the parting lines, resulting in the defect formation. 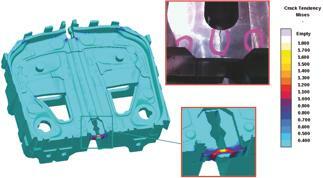 This hypothesis was tested using a silicone rubber band to obtain an improved sealing of the relevant areas of the tool. With this modification, a new core was produced which was absolutely free of any defects. Casting process simulation software considers the complete casting process including mold filling, solidification and cooling, and also provides the quantitative prediction of mechanical properties, thermally induced casting stresses and the distortion of cast components. 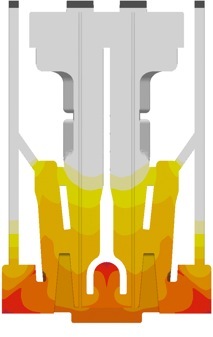 Simulation accurately describes a cast component’s quality upfront before production starts, thus the casting layout can be designed with respect to the required component properties. This results in a reduction in pre-production sampling, but also the precise layout of the complete casting system leads to energy, material and tooling savings for the foundry. The range of application of MAGMA solutions comprises all cast alloys, from cast iron to aluminum sand casting, permanent mold and die casting up to large steel castings. The software supports the user in component design, the determination of melting practice and casting methodology through to mold making, heat treatment and finishing. 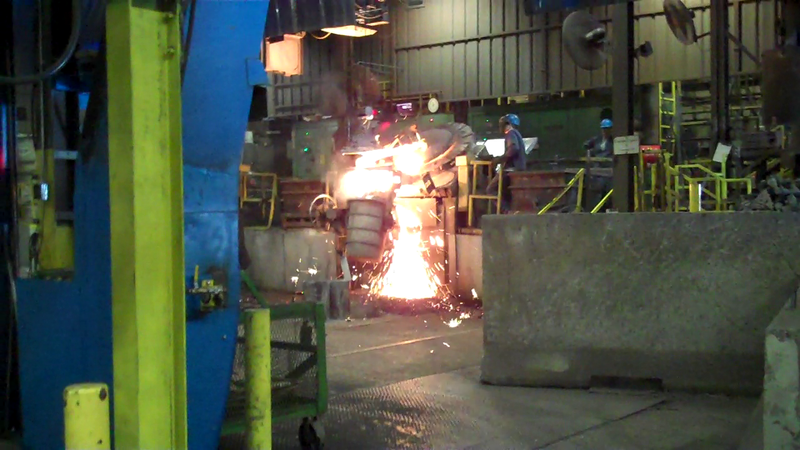 This saves costs consequently along the entire casting manufacturing line. During the last 10 years, the use of casting process simulation has become a valuable business asset for many foundries worldwide. MAGMA5 constantly expands the capabilities of casting process simulation and will further accelerate the acceptance of this technology, in the future. With 50 years of operation, Usiminas is the leader in the Brazilian flat steel market and one of the largest steel companies in Latin America. It has a nominal capacity of 9.5 million tons of steel per year. Usiminas Mecânica is a leading provider of capital goods and services to the steel, railway, mining, automotive, energy, petrochemical, marine and infrastructure industries in Brazil. With recent substantial investments, the foundry of Usiminas Mecânica has become one of the largest manufacturers of both small and large steel castings in the country. The yearly production capacity is 30,000 tons, representing about 10% of the projected production in Brazil. MAGMA offers comprehensive solutions to the metal casting industry, casting buyers and casting designers worldwide. The MAGMA product and service portfolio includes the powerful modular simulation software MAGMASOFT®,with the newest release MAGMA5, as well as engineering services for casting design and optimization. Today, MAGMASOFT® is used throughout the metal casting industry, especially for the optimization of cast components in automotive and heavy industry applications. MAGMA Giessereitechnologie GmbH was founded in 1988 and is headquartered in Aachen, Germany. A global presence and support are guaranteed by offices and subsidiaries in the USA, Singapore, Brazil, Korea, Turkey, India and China. Additionally, more than 30 qualified partners represent MAGMA around the world. Steve Sikorski from Magma (far left) led the teaching experience for the Racine, Wisconsin Sea Scouts, as they learned about metalcasting. 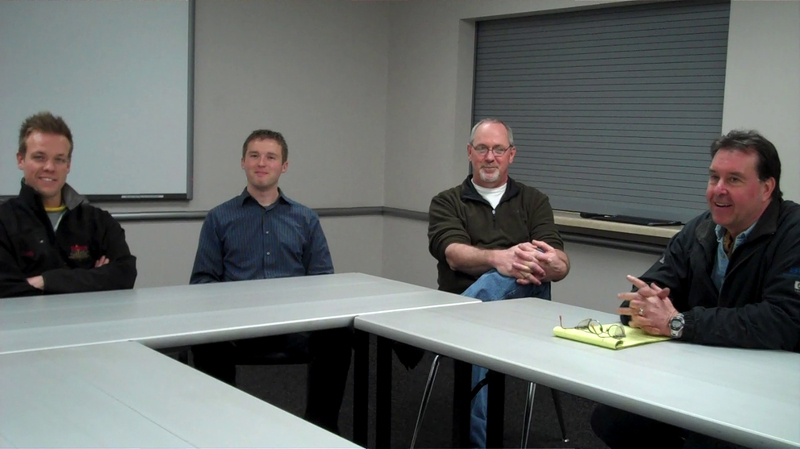 In March 2013, representatives from MAGMA Foundry Technologies used the Foundry in a Box, donated by AFS, to teach the Racine, Wisconsin Sea Scouts, Ship 5750, about metalcasting. Sea Scouting is a division of the Boy Scouts of America for young men and women between 14 and 21 years old. The group focuses on developing future leaders through developing maritime skills, both on and off the water. The Scout group devotes their summer activities to sailing and their winter activities to learning manufacturing skills to produce useful items. Previous projects included land sailing vessels, a pig roaster and rebuilding engines for use in boats. During this past winter, the scouts focused on developing their metalworking skills by making wind vanes using welding, grinding, machining and plasma cutting technologies. This project had all the Scouts excited about metalworking and it created a great opportunity to expose them to metalcasting technology, where Magma is the market leader in casting simulation and process optimization for foundries worldwide. The meeting was kicked off with a short presentation about metalcasting and how this 6,000-year-old process relates to products the Scouts use every day. The Scouts were then allowed to get started with a hands-on project, with each Scout creating a mold, melting the metal, pouring the casting and cleaning the castings. Some Scouts used the standard patterns that came with the Foundry in a Box, while others were more adventurous and tried making their own patterns, one being sea shells. A final presentation was made, tying in this age-old process with advanced casting process simulation technology to show what occurred inside the mold during the making of the Liberty Bell casting. In addition to the ability to simulate the entire casting process, Spokane has found a solid partner in MAGMASOFT® by taking advantage of the resources extended to them as a user. “The user group meeting every year is a very good tool to keep us informed of new developments and get everyone up to speed on anything we feel we would like to improve upon. Peer-to-peer discussions on how we each utilize the software are invaluable,” Melendez says. Schaumburg, Illinois (Chicago) – With MAGMA5 5.2, MAGMA Foundry Technologies has recently released the latest version of its leading casting process simulation software with significant new and improved functionality. More than 160 improvements were implemented for the user in this new release of version 5.2. The main focus of the development efforts was on increasing the efficiency in evaluating simulation results. MAGMA5 5.2 now allows the direct comparison of up to four different project versions in the result perspective. Filling, solidification and stress results can be animated in a synchronized mode. A special highlight is the option to display the geometry and all MAGMA5 results in 3D stereo, using shutter or red/cyan 3D glasses and to store them as 3D images or movies. Various new tools facilitate a standardized result evaluation. New result criteria allow for a more effective evaluation of metal cooling and critical metal speeds during filling. The progress of feeding and porosity formation can be monitored and displayed continuously during the entire solidification process. A new criterion to predict cold cracks allows the user to find stress-related casting quality problems more quickly. The implementation of user results further offers a powerful tool to compile user-specific criteria based on any MAGMA5 results. User results can easily be defined and created automatically during a simulation or subsequently in the result perspective. All users will benefit from the new “resume point” capability, which allows flexibility in re-starting the simulation with modified die casting process conditions, based on the previous or next-to-last casting cycle. 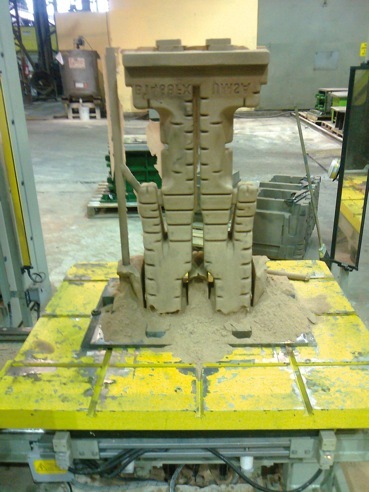 Sand casting processes can be resumed with different conditions at the end of any process stage. The automatic enmeshment of complex geometries is now further simplified by new enmeshment criteria and procedures. 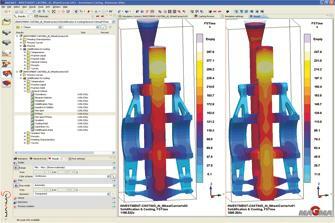 Stress simulation results can be prepared for faster post-processing. For the quantitative assessment of casting distortion in the measurement perspective, it is now possible to compare the virtual measurement with the real part geometry. Finally, with MAGMA5 5.2, a new database of riser sleeves, which was generated by ASK Chemicals, is now available. MAGMA offers comprehensive solutions to the metal casting industry, casting buyers and casting designers worldwide. MAGMA’s product and service portfolio includes the powerful, modular simulation software MAGMASOFT®,with the newest release MAGMA5 as well as engineering services for casting design and optimization. 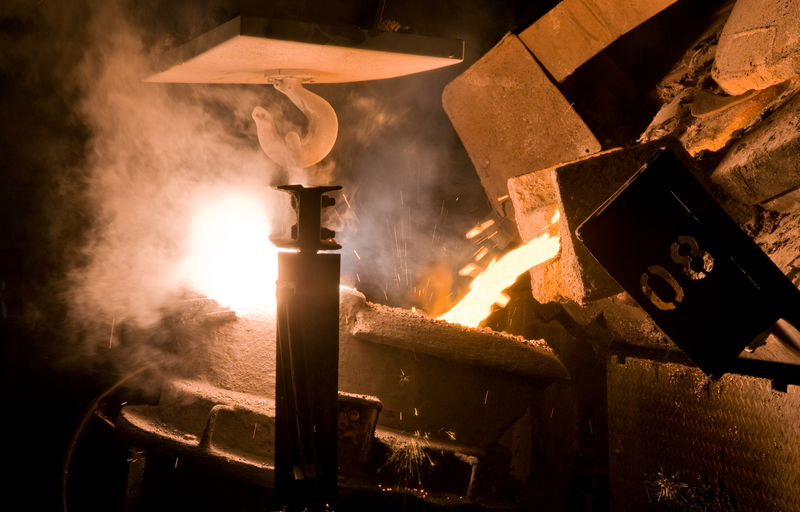 Today, MAGMASOFT® is used throughout the global metal casting industry, especially for the optimization of cast components in automotive and heavy industry applications. 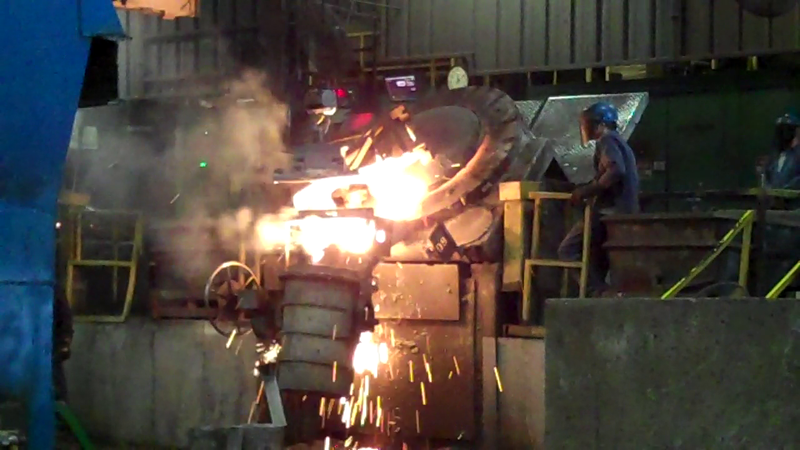 Dotson Iron Castings in Mankato, Minnesota is an iron foundry that melts and pours 100+ tons of ductile iron castings daily, using 20X24 horizontal, high pressure, green sand molding machines. Products include over 3,000 different castings for over 300 customers in a wide range of applications including medical, transportation, agriculture, construction and recreation equipment. The raw casting weights here range from 2 to 50 pounds with typical production quantities ranging from 25 pieces to several thousand. Dotson prides itself on engineering excellence, providing customers a higher total value with castings designed and produced in a highly automated, quick response foundry and machining facility. Operating as a foundry for over 130 years, Dotson credits its success to satisfying customer needs by not only managing, but exceeding, their expectations. The goal is to provide customers with quality products in a fast, flexible, cost effective manner. As a company best practice, Dotson includes its employees in making all important decisions that will impact not only the job of each of the individuals, but the foundry as a whole. Dotson has a program called, “The $10,000 Project.” As the name implies, any purchase made by the foundry of $10,000 or more is done through a detailed process involving the employees who will be most affected by the purchase of the product or equipment being considered. Any product or project that costs over $10,000 must have a cross-functional group examine all viable options. Members of the group choose what they consider the best product or piece of equipment to help them accomplish their goals. They then make onsite visits, make comparisons and do cost justifications. With the information they have gathered, they then make multiple presentations to the group explaining the “what” and the “why” of the product, equipment or service they have chosen for consideration. When Dotson’s owner Denny Dotson and President /CEO Jean Bye wanted to expand their capabilities in terms of serving customers with solidification solutions, MAGMASOFT®, provided by MAGMA Foundry Technologies (Schaumburg, IL) was one of the many software packages considered. “We certainly are a foundry that differentiates ourselves on our engineering services and to do that you must have the right tools,” Jean Bye said. “We researched and explored our options for a few years before making the decision to purchase simulation software for the foundry,” Denny Dotson adds. The $10,000 Project is a lengthy process with the participants sometimes making three or four presentations to support their argument. 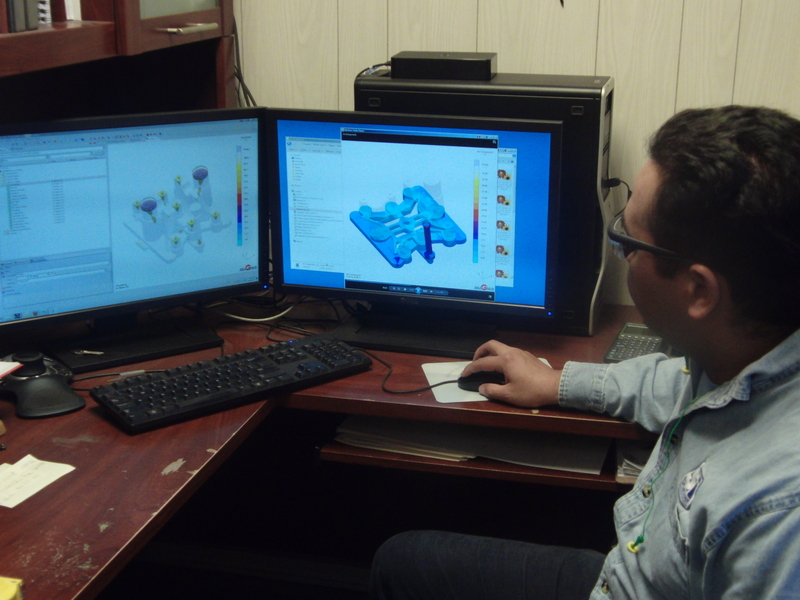 Deciding on the simulation software that best supported the needs of this foundry took a long time, due to the importance of doing numerous comparisons. When comparing the benefits of all the products being considered, “…it came down to weighing out the factors and deciding which ones would have the greatest impact on the overall foundry operation,” Bye stated. Dotson saw the addition of simulation software as more then just an engineering tool; rather it represented a smart business tool specifically designed to improve yield as well as positively impact sales. There was a lot to consider in the justification process beyond the product’s capabilities. Ease of use, speed of use, accuracy of results, presentation of these results, reputation of the provider’s company, customer care, quick response time from company representatives when there was a question or assistance was needed, as well as which company Dotson felt was more technologically advanced with new innovations. 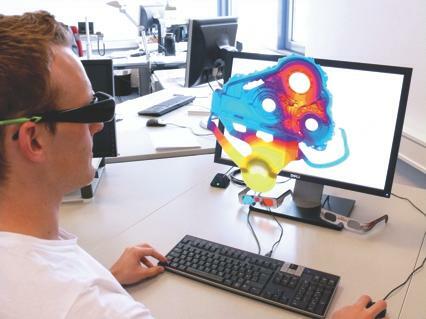 In addition, a significant benefit Dotson saw with simulation was the ability to identify jobs that would require some type of stress relief before actually making the tool or gating system. “It’s much more difficult to go back to the customer after the fact and tell them this is your cost, than it is before you cut the tool. 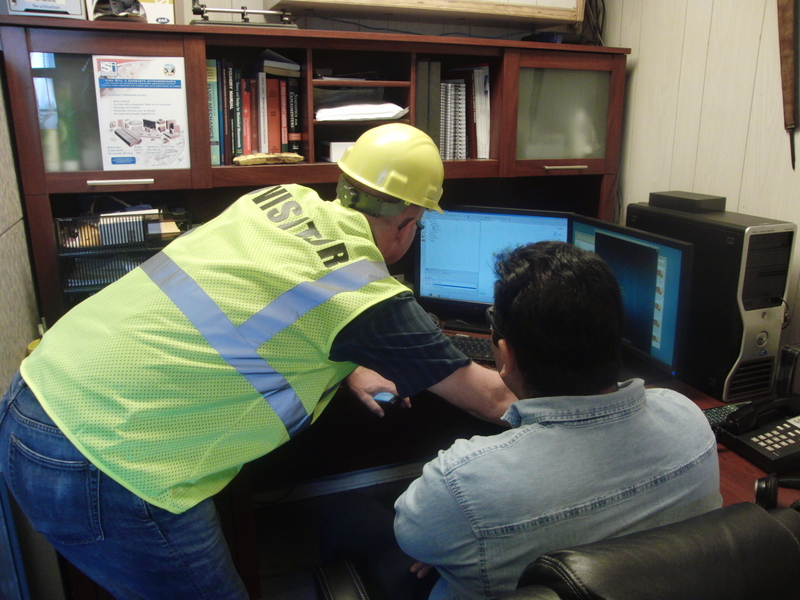 There are always options before anything is created,” Engineering Process Manager Jim Headington points out. “Moving from opinion or educated guess to a factual report supporting changes has made it quicker and easier to communicate the need for making changes with our customers,” adds Jay Zins, Control Manager at Dotson. On one recent customer project, Dotson ran approximately 30 virtual iterations on a particular part. Not only did having the ability to simulate the entire molding process save a significant amount of time, being able to run a large number of iterations also helped them be sure that the quality of the part was not compromised. “Once in a while, on projects like this, we do 30 simulated iterations, simply because we now can,” Josh Jaycox, Quality Assurance Engineer adds. While all new jobs at Dotson are run through MAGMASOFT®, retro jobs, especially the high yield jobs, are also now simulated. A significant part of the justification process was improving yield. When considering yield improvements, Dotson recognizes that the improvement in the first year will normally be significant, as they hadn’t run simulation before, whereas moving forward, improving yield would be less significant, as all new jobs are now run through the simulation and, as a result, are more efficient from the very beginning. “Running the software on a casting will also help us see that it may be possible to make a riser smaller, this will help in de-gating and reduce grinding time.” Jaycox said. “It’s almost like having a third party in the room giving our observations credibility,” Bye adds. Seeing the importance of being sure their foundry and their engineers have the tools to be the best they can be, Dotson found the addition of MAGMASOFT® to be a natural next step. When considering the in-depth justification process and the criteria involved in bringing a new product or tool into the foundry, they learned their decision regarding process simulation to be a great benefit to the company overall. Dotson realizes customers now expect and rely on the fact that their parts are run through this virtual process with the end result being the highest quality castings possible. Choosing MAGMASOFT®, Dotson believes all their performance and value criteria were met and, in many cases, even exceeded. 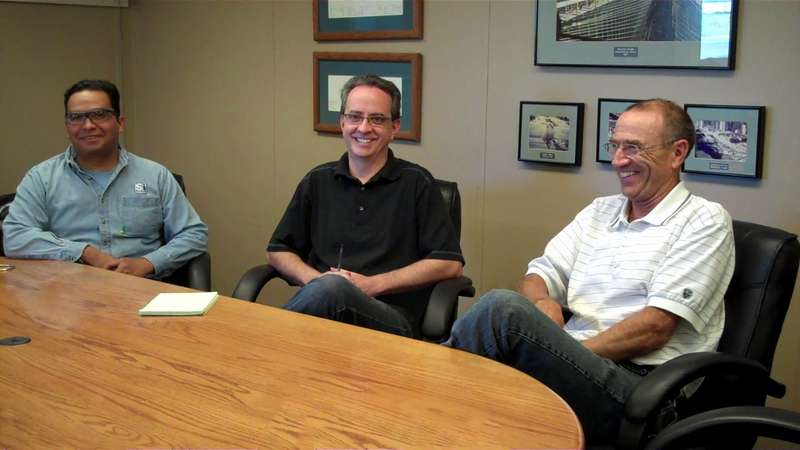 MAGMA’s reputation in the world foundry market and their customer care program, as well as the added benefits of their training programs and annual user group meetings, help Dotson feel more confident in their partnership with MAGMA, according to Jaycox and Headington.